An intermediary’s position as transaction creator. The traditional model of a passive IP broker is broken. We believe times, and the market have changed, and buyers now have more sophisticated buying criteria, and demand a professional, proactive engagement with the intermediary. It is vital for intermediaries today to demonstrate that they can add value to the process; and importantly this means showing that we understand the market and understand the IP and its underlying value to the buyer; creating high quality pitch books with deep technical analysis. An IP Intermediary sits at the core of specific markets and has a unique opportunity to identify assets that buyers see as valuable. From our experience supporting transactions we have been able to develop a set of automated tools to exploit our knowledge and rapidly target assets that fit the market needs. We are also able to rapidly assess large portfolios to identify candidates for transactions based on a combination of market knowledge and patent metrics. Combining patent analytics with our experience of the trigger points of buyers, we have developed tools and techniques to assess the relative strength and attractiveness of patents. Cubicibuc’s automated approach to patent evaluation means we can quickly assess portfolios to identify those that fall into sweet-spots for buyers according to technical, commercial and targets appetites. 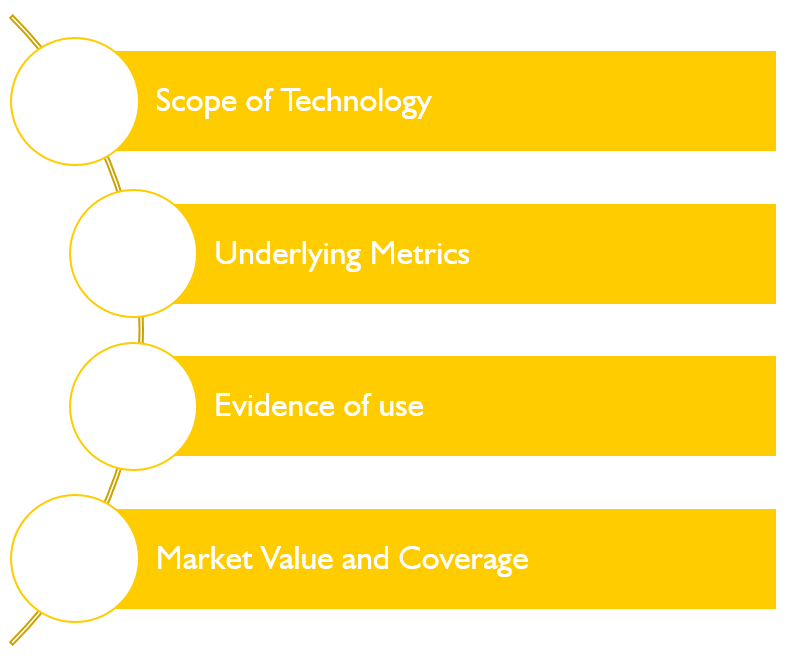 Our analysis goes beyond simply scoring patents based on patent data, but builds in our intimate knowledge of the market place, allowing us to rapidly target assets that fit the market needs. Patent metrics such as life left are key measures for many buyers. Buyers consider life left when looking to enforce patents, or as a medium to long term strategic investment. Geographic coverage can also play a significant role in determining a match between alleged infringing products and markets. The number of citations a given patent receives (forward citations) mirrors the technological importance of the patent for the development of subsequent technologies, and also reflects, to a certain extent, the economic value of inventions. Cubicibuc’s analysis not only considers the number of forward and backwards citations of each patent, but also the identities of the organisations. Cubicibuc’s approach assigns weightings based on the importance of those organisations in the market. Where “Target Companies” are identified Cubicibuc’s weightings bias the scores, hence highlighting patents with potentially “stronger” citation maps. Likewise, self-citations can be removed, or lowered in significance. While the risks of injunctions from competitors using patents, particularly Standards Essential Patents (SEPs), appears to have reduced over recent years there are still real risks from patent enforcement. A key element of the business case for wireless enabled products is the licensing cost for Standards Essential IP, and whether indemnifications are provided by suppliers. While it is commonplace for manufacturers to commence production without all licences in place, it is also prudent to make provisions for future licence demands. As consumer electronics products become commoditised the available margin and sensitivity to such licensing provisions is increasingly important. The activities of Non-Practicing Entities only complicates the picture as NPEs are often immune to counter cross-licensing negotiations. NPE also reduce ownership transparency and dissipate the patent landscape making royalty rate benchmarking difficult. How the patent relates to the wider patent landscape associated with the technology – and hence the relative size of the patent portfolio to the entire patent landscape. We work with businesses ranging from smaller start-ups to mature multinationals; from early stage invention capture through to exploitation and monetization of IP assets. We have direct experience of the full IP lifecycle from early stage R&D and IP creation to post-grant management and exploitation, including licensing, enforcement and transactions. Cubicibuc provides IP Audit and IP Health-check services to enable clients to maximise the value of their investment in technology. By understanding the true state of IP they are about to import, clients are empowered to make informed decisions about pricing and risk. Cubicibuc also provides technical subject matter experts to act as expert witnesses in patent litigations and other disputes. For more information regarding Cubicibuc and our thinking, please contact us now.